Relax on our large balcony with stunning views after a day on the slopes, or out in the beautiful Austrian countryside. Snooze by the pool in the summer, and sleep in the most comfortable beds, with crisp white linen and fluffy towels. Our spacious apartment, in a converted Chalet, is ideal for families and couples alike. It's brilliant for skiing/boarding in the winter, and walking, cycling and outdoor adventures during the summer. For details of Skiing/Boarding go to http://www.zellamsee-kaprun.com/en/activities/ski-board. Alongside the Schmittenhöhe with 77 kilometres and the Kitzsteinhorn with 41 kilometres of ski slopes, the Maiskogel family mountain with 20km of slopes also has excellent winter adventures in store, with excellent snow-making facilities on all slopes. Saalbach/Hinterglemm is only 20 minutes by car too. The Ski Bus is free with a Lift Pass and only a few minutes walk from the apartment. You can see the Maiskogel slopes (Kaprun) and Kitzsteinhorn Glacier from the balcony and the substantial Schmittenhöhe ski runs (Zell am See) are a short 10 minute Bus or Car journey, with free parking. The Tauern Spa is just down the road, as are two supermarkets and various very good restaurants. The views from the balcony are breathtaking and the sight of the sun coming up or going down behind the snow capped mountains is a memory that will stay with you forever. It has 2 large double bedrooms, 2 bathrooms, 2 toilets and 2 spacious walk-in wardrobe/dressing rooms. The open plan kitchen/living room has a sofa-bed, flat-screen TV and DVD player. All rooms open out onto a large south facing balcony with panoramic views of the Grossglockner mountains and valley below. The property also benefits from a heated outdoor pool, residents' lounge, free WiFi and private garage. It is a true year-round location with superb outdoor activities available in the summer, such as cycling (off-road and dedicated tracks), wonderful scenic walks and water-based activities on Lake Zell. It is also ideally situated for the ski season, which starts early in Kaprun. 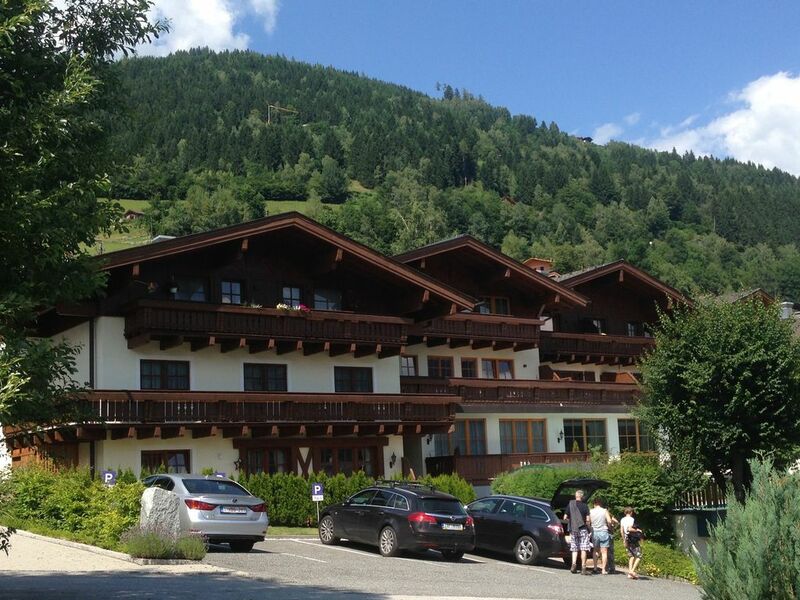 The Kitzsteinhorn Glacier offers year-round skiing and the apartment is only 80 yards from the ski bus, with Zell am See, Saalbach, Mittersill, Bad Gastein, & Kitzbuhel within 5-45 minutes away. The kitchen is very well equipped and the local food shops very good, so you can easily self cater. However, there are a number of excellent restaurants to suit every budget in Kaprun and Zell am See for those that prefer to eat out. An added benefit of the accommodation is the services of an Onsite Building Manager, who is available each morning. You will also be visited by our Housekeeper, Gerdi, who can talk through restaurant recommendations, sites, ski areas, etc. The apartment benefits from a 15 metre long heated outdoor pool which is open from May to end September. There is an adjacent grass area and sun loungers for relaxing. From here the view across the Hohe-Tauern National Park to the Kitzsteinhorn glacier and Kaprun ski areas is breathtaking. There is a lockable bike store, private garaging for 2 cars and a new, large ski/boot room with heated racks is easily accessible on the ground floor, near the main entrance. Our apartment is ideally located for taking full advantage of the superb hiking and biking trails, both through the valley and in the mountains. You can even walk directly from the apartment to the top of the Scmittenhohe slopes, which are immediately behind the apartment and run directly down to central Zell am See. Local bike hire can easily be arranged and we can also arrange guided hiking tours, both half and full day! Please read the Guest Reviews and you will see that all our guests love the area and comment on how much there is to do. If you require any further information, please let me know. My name is Catherine, and my husband and I are the owners of the apartment. We have one daughter and live in Essex. I worked in the City of London for 20 years, but gave up work to look after our daughter. I am now actively involved in our local community and I'm also a Justice of the Peace. We had been looking to purchase a holiday property for some time, without much success. When we saw the details for this property we acted uncharacteristically quickly and decided to go ahead and buy it. We are all keen skiers, so this area is perfect, particularly as the Kitzsteinhorn Glacier provides guaranteed snow. But as the apartment is within easy driving distance of some many other resorts, the scope for skiing in years to come is virtually endless. But we wanted more than just a winter holiday from our apartment. Having just spent two weeks there in July 2011, there was so much to do we didn't want to leave. With temperatures averaging higher than London, it is a perfect spot for outdoor activities and marvelling at the wonderful scenery. We hope you enjoy it too. The view from the balcony and windows is what really makes this property special. When you wake in the morning, with the sun filling the room, you can see the valley and snow-capped mountains beyond from your bed. All the amenities of Kaprun and Zell am See are within easy reach and the quality of the restaurants is really quite amazing. The outdoor heated pool is also a real bonus, whether for the children to play in or to relax in at the end of the day. And as the sun goes down, just sit back on the balcony and enjoy a cold glass of Gruner! There are 4 short flights of stairs to reach the apartment so it is not suitable for people who have accessibility issues. Final clean fee. No additional charges for gas or electricity. Please bring own pool and spa towels. Our family had very good stay at this well equipted apartment. Catherine answered very quickly for my email and was very helpful. The apartment was easy to find and fulfilled all our expections. It was spaceous and clean. The beds were very comfortable and two bathroom is luxury ! We can highly recommend this apartment. We were blown away by the size and space that the apartment offered. It's in a great location and the apartment is very comfortable and well equipped. Catherine was extremely helpful when booking and thanks also to Gerdi whose help and advice while we were there was invaluable. Only hope we can return again sometime soon. Thank you very much for taking the time to review your stay and I'm so pleased you enjoyed the apartment. We take a lot of pride in making sure that our guests enjoy their holiday and try and ensure it is a "home from home" experience in terms of what we provide in the apartment. Gerdi is a huge asset and loves making sure guests make the most of their time in Austria. Mind you, with that scenery and location, it is just a picture perfect location for a holiday and we hope to see you again! This is the second time we have stayed at this apartment and again it didn’t disappoint. Lovely sunny deck with great views and good location. Property was in a beautiful location, the view was spectacular. Owner was very easy to deal with and accommodating. This was a last minute rental for us and did not realize how many stairs which made it difficult for my father but we made it work. Supplies are scarce, had to request dish cloths, t towels and dish soap. The first two were supplied the dish soap we were told "we use the dishwasher". No salt, pepper, or oil were supplied. While very clean for the most part, there were alot of "dust bunnies, etc" behind the couch. This may have been because of the last minute rental. Overall we were happy with the location and facility. Thanks very much for taking the time to write a Review. Apologies for not having our normal "supplies" available. We had planned our normal seasonal "spring clean" the day you arrived, but as this was a last minute booking this got rearranged to later in May. At that stage, we not only stock up on supplies, but we always ensure the extra cleaning is done, including pulling out the sofa to kill those dust bunnies! I'm glad you enjoyed the lovely view though and the countryside around. We were a party of 2 couples and the set up of the property was perfect for us, with a suite of rooms for each couple (bedroom, toilet, bathroom and dressing room) and then a shared kitchen/dining room/sitting room. The apartment was clean and warm, with absolutely stunning views from the balcony. Situated close to Kaprun and Zell-am-See, we were able to use the ski, shop and restaurant facilities in both and also walked to the unbelievable Tauern Spa, which has 3 outdoor pools and we had fun swimming while the snow fell around us. I would absolutely recommend this property. Chris, thank you for taking the time to do such a great review. I'm glad the stay worked out well for you all and we would love to welcome you back again, perhaps in the summer so you can enjoy those fabulous views from the balcony! Transfers from Salzburg: 90 mins by train. 105 mins hours by bus (260 bus) or 90 mins by hire car. Transfers from Innsbruck: 120 mins by hire car or train. Transfers from Munich: 150 mins by hire car. Driving in Austria is easy and the routes from the Airports are all very straightforward and wonderfully scenic. This beautiful part of Austria is a true alpine gem and a great year-round destination. If you are planning a summer holiday, you will be spoilt for choice with 200 km of bike cycle routes in the valley and 700 km of well defined mountain bike routes for the more adventurous. There are wonderful Hiking Trails for all abilities and ages, as well as water-based activities on beautiful Lake Zell. The best bike hire is with Inter Sport. They are all over the place but best locations are in central Kaprun and at the bottom (south) end of Zell, next to the train station (Bahnhof). Best place for kayaks, electric boats, banana boats etc is Thumersbach on the west side of Zell See. Great place for lunch too, or as a half way stop when cycling round the lake (allow one hour for a leisurely peddle all the way round). On wetter days the Tauern Spa (1km on road to Kaprun) is fantastic. You can buy 3 hour passes or one day passes. The water slide is great fun! Take your own towels, robe and flip flops if you have them, although you can hire/buy them there. There is an excellent cafe and you charge all food/drinks to your wrist band, settling up on the way out. The Sigmund Thun Gorge and Lake is a great trip for all the family as well as the Krimmel Waterfalls. In Zell - Crazy Daisy; Deins and Meins; Steinerwirt (all central). Wider a field - Kitzbuhel is approx 45 mins away, heading away from Zell towards Mittersill. Great views along the way and particularly tight hair pin bends as you head up to Pass Thurn. Salzburg is also a great day out. Plenty of historic sights, wide range of shops and great coffee/cake places. The drive takes just under 2 hours, although it may be just as easy to go by train from Zell (1 hour 36 mins) as this brings you right into the town centre. Our guests are offered a 40% discount on ski/boot hire from a local shop. Zell am See - Kaprun, base for the US Ladies’ Ski Team, is one of the most beautiful areas in Austria with altitudes up to 3000 metres and 139 km pistes for all abilities. The apartment gives you easy access to the three main ski areas. There is a Ski Bus (included in your Lift Pass) that runs at regular intervals 2 minutes walk from the apartment that takes you to Kaprun (3 minutes trip), Schuttdorf (5 minutes) and Zell/Scmittenhohe (10 minutes). Two cable cars take you quickly from Kaprun to the lift connection of the Kitzsteinhorn. From Zell am See three rapid cable cars depart for the highest peaks of the Schmittenhöhe. From Schüttdorf there is a connection with the Areitbahn to the Schmittenhöhe. Saalbach Hinterglemm, Leogang and Mittersill are just 15-20 mins away. From Mittersill you can link to Kitzbuhel via the new Panoramabahn cable car, or drive direct to Pass Thurn and Kitzbuhel in 30 mins. Golfers have a choice of two championship courses at the Golf Club Zell am See which affords spectacular views of the Kitzsteinhorn. The golf courses are open for play from April through November and are the largest facility in the Austrian Alps. The par 72 'Schmittenhöhe' course measures 6,837 yards for the men, and women play it from 5,881 yards. Although the 'Kitzsteinhorn' layout is shorter than the 'Schmittenhöhe' at 6,565 yards for the men and 5,844 yards for the ladies it plays one shot more with 73 as par. There is an excellent pro shop, with a British pro, and a driving range and practice putting green to warm up your skills. There is also a full service restaurant and bar where alcohol can counter-act all the previous water. In addition, there are 28 other spectacular courses within a 45 min car journey, including Mittersill, Saalfelden, Bad Gastein and Saalbach. Towels and bedlinen free for up to 4 people, €10 pp after that. Non refundable deposit of €150 at time of booking. Final balance due 60 days prior to arrival. Guests will be contacted by our representative during their stay and she is happy to advise on ski hire, restaurants etc. Changeover day Saturday, unless by arrangement. There is a mandatory payment of Austrian Tourist Tax, which is €1.20 per adult per night, over 15 years of age.